St. Martin's Paperbacks, 9780312362737, 368pp. When private investigator Carlotta Carlyle is wakened by a late-night phone call, she discovers that her "little sister," Paolina, the child with whom she was paired years ago by a local mentoring program, is missing. Carlotta combs the Boston streets looking for Paolina, torn between anger at the thoughtless teenage runaway and anxiety that something has really happened to her. Paolina is more than a sister to Carlotta. She's the daughter she never had, or never owned up to having. She's the one constant in Carlotta's life, more reliable than Sam Gianelli, her mob boss lover, a man whose always unpredictable behavior has become increasingly mysterious. 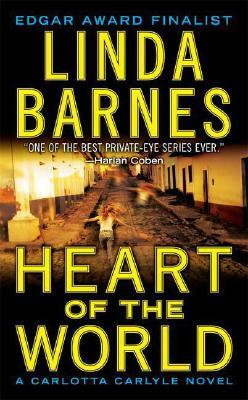 Heart of the World, Linda Barnes's most intense, personal, and suspenseful Carlotta Carlyle novel yet, follows Carlotta's trail from New England to Miami to Bogotá and beyond as she probes the connection between Paolina's disappearance and the corresponding disappearance of the Colombian drug lord father Paolina has never met. A breathless and shocking read, Heart of the World is perhaps Barnes's best. Linda Barnes is winner of the Anthony and American Mystery Awards, an Edgar Award finalist, and the author of the Carlotta Carlyle mysteries, including Heart of the World and Lie Down with the Devil. She lives in the Boston area with her husband and son.